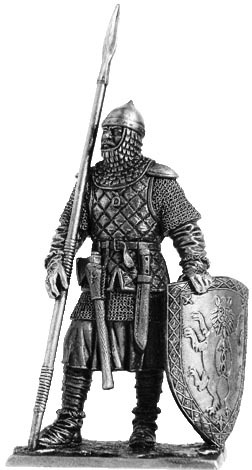 Throughout the 14 th century infantry in the armies of the Russian principalities, as in Western Europe, playing on the battlefield an increasingly prominent role. Dense infantry build, bristling with spears and backed by archers and crossbowmen, became a formidable force. Complex weapons and protective gear grunt-spear reflects purely Russian traditions. Spear or fork and battleaxe regarded as the principal weapons of foot soldier late medieval Russia. Head infantry protects spheroconical helmet with scaly aventail. Printed quilted armor of painted linen is put on chain mail and steel reinforced shoulder straps. The shield is made of wood, covered with leather, canvas and painted colors. Metal and panels, as a rule, did not have, except the nails, attached belt and arms. Notify me of updates to Russian foot soldier, 14-15 cc.